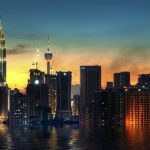 Malaysia’s capital, Kuala Lumpur (KL), is a thriving multi-cultural metropolis that has so much to offer: delicious food, famous sights and so many accommodation venues, for all tastes and wallet size. 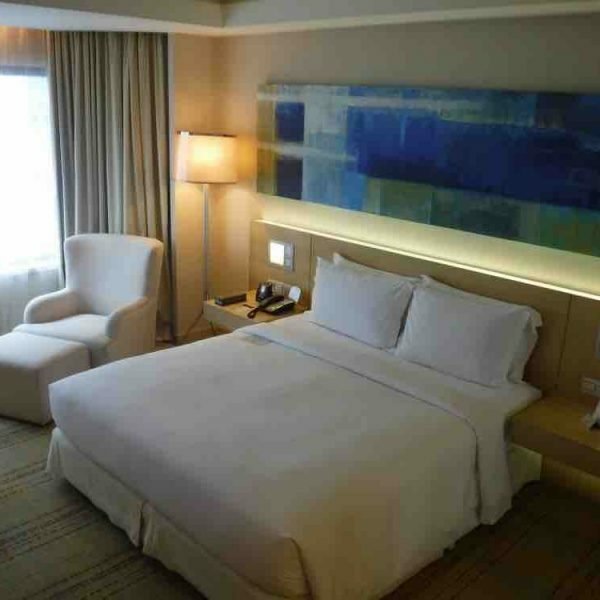 For our 3 day trip in KL this February, we choose to stay at the DoubleTree by Hilton Kuala Lumpur, since the hotel is focusing now more than ever on families. The DoubleTree hotel chain, now part of the Hilton brand, is well renowned for their culture of care. Let me tell you a little bit more about our experience staying there. As soon as we got off the escalator to the lobby of the DoubleTree KL, the bellboy came directly to welcome us and take our luggage. Then followed a series of heartwarming attentions that made us feel taken care of. First, to the delight of Emma-Kate, and us too, we were offered each a huge warm chocolate chip cookie. It was chewy and sweet! There was also a refreshment station with ice tea and cucumber water to hydrate ourselves. After experiencing Kuala Lumpur’s heat, I have to say I was happy to have a healthy drink. But that wasn’t the end of our little girl surprises: she received as a present a nice coloring book and 12 crayons. She was so excited! You know how kids like presents! I thought it was a nice gesture, and a generous one, since she usually only receives 3 crayons and 1 picture to color at restaurants and hotels. I have to say that the welcoming attention all started even before we got to the hotel. We were supposed to stay in an accessible room, since I have been researching how people with disabilities can easily (or not) travel. The day before our arrival, they contacted me by email: the only accessible room available was a smoking room, and since we were traveling with a toddler, she offered us to change to a non-smoking Executive suite. I was very pleased and touched by this attention, because as a parent, we never want to jeopardize our kid’s health. 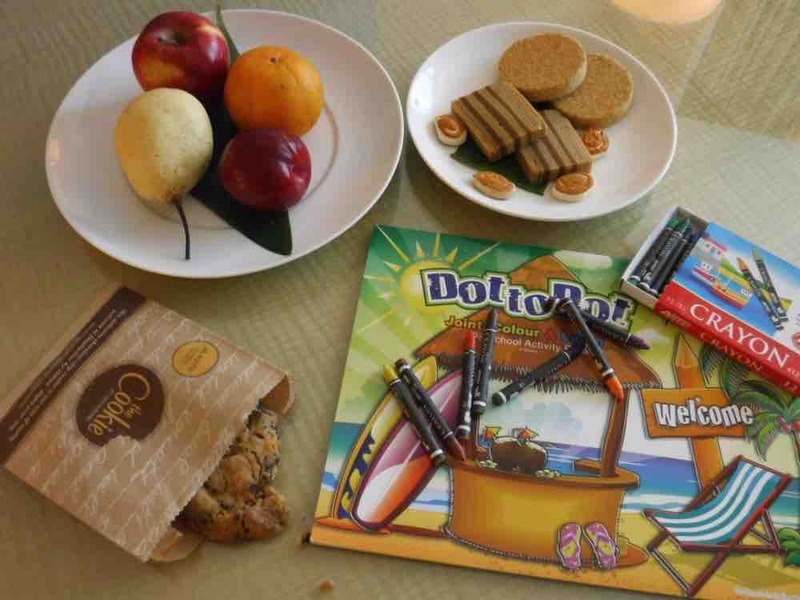 Being at first a business hotel, I think the DoubleTree KL has made a lot of effort to please and accommodate families, and they show it in a very kindly way, paying attention to the little details that makes a lot of difference for us, parents and kids. Since we were expecting at first to have an accessible regular room, we were very pleased to stay in an Executive Suite. I have to say the setup of the room was just perfect for my family, since it had 2 distinct very spacious rooms: a living room with an office space and kitchen facilities, and a large bedroom. So in the evening, I could work and Clinton could watch TV, and then we could transfer Emma-Kate’s crib in the living room when we would go to bed, so we would each have our room and privacy. To my husband’s delight, there was a TV in both the living room and the bedroom, with satellite channels, and I was very happy to have an office space with fast wifi where I could blog and charge all of our electronic devices. We also had a small dining table with a fresh plate of local fruits and delicacies, and chairs, very useful for an afternoon snack. The kitchen space was very useful too. There was a fridge with a mini bar, a sink (to wash Emma-Kate’s sippy cup or a baby’s bottle), a coffee maker, a choice of teas, coffee, glasses of wine and a lot of cupboard space. I think it would have been useful to have dish towels and dish soap, though. The bedroom was very comfortable. The bed linens and the down pillows were so soft, and sleeping in the king size bed was very restful (not that I don’t like to cuddle!). There was a regular size closet with a safe, a bathroom scale (I was happy to see I haven’t put on weight after a month of travel! ), an easy chair and a footstool. Emma-Kate’s large crib was already in the room when we arrived, with a baby pillow and a comforter too. She slept like a baby in it. 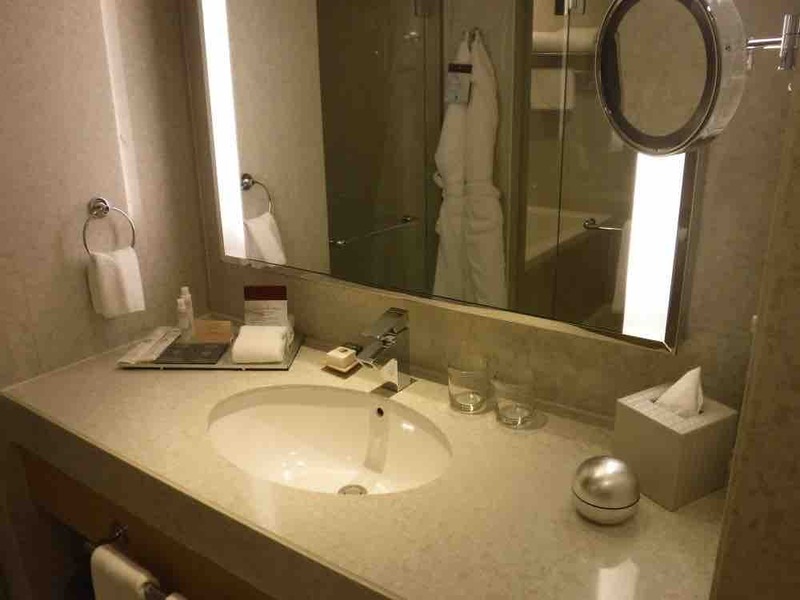 The bathroom was my favorite room in the suite: it was spacious and had a separate room for the toilet, which can be quite useful when traveling as a family. 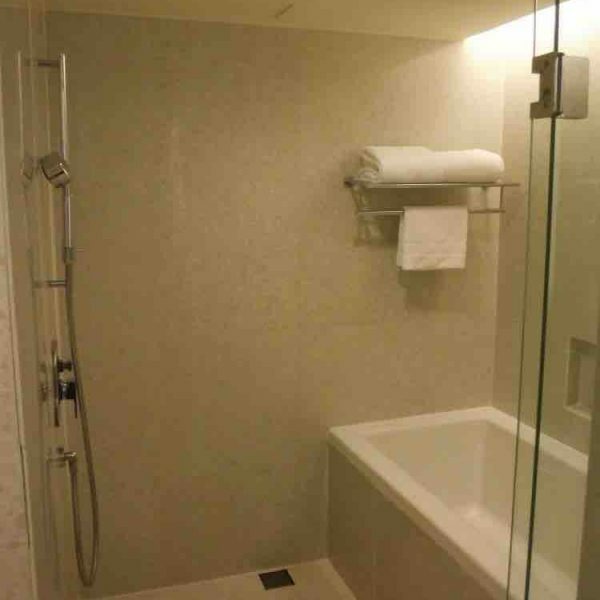 Also another great feature for families: there was a rain shower head and a hand held shower, and a bath too, so everyone could have a relaxing moment at the end of the day. Moreover, they provided essential and comforting amenities: toothbrushes and toothpaste, shower hats, bathrobes, bath slippers, large and very fluffy towels and washcloths, enough shampoo and conditioner for the whole family (regular shampoo, not tear free for babies). 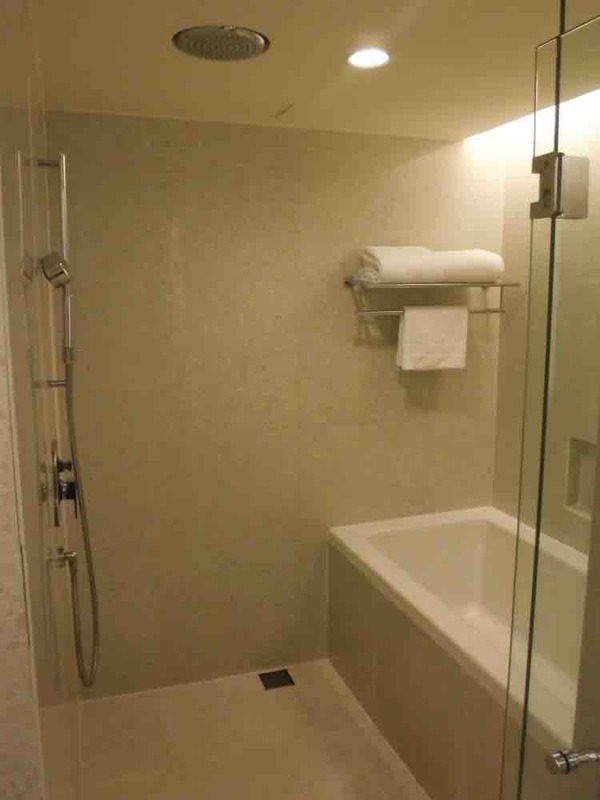 Last but not least (and you know what I am talking about if you have been traveling in Asia), a door that keeps all the shower water IN the shower, and not all over the bathroom. One thing I would have used is more hooks in the bathroom, so that I can at least hang my toiletry bag. There was 2 hooks available, but they were used to hang the 2 bathrobes. Finally, there was a leather chair in the living room that could be used by kids to have access to the bathroom sink. Again, very useful for young families. 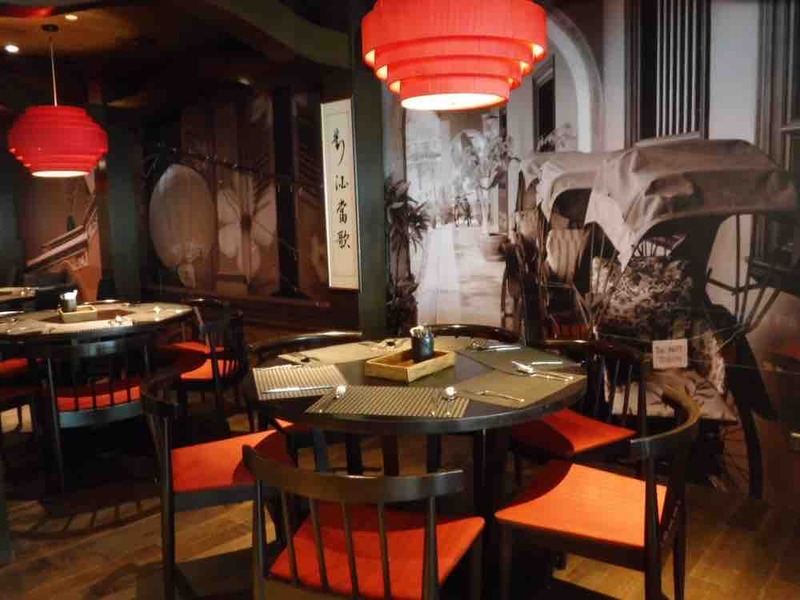 There are 5 restaurants located inside the DoubleTree KL. 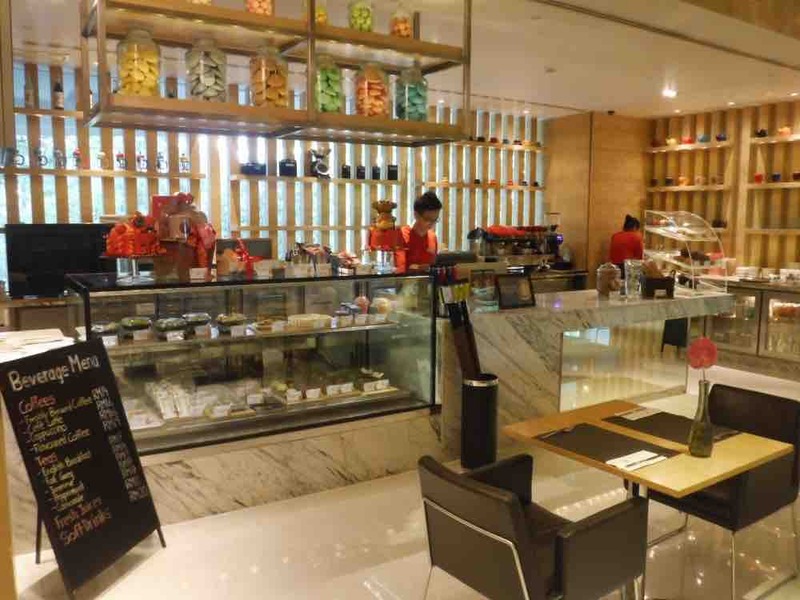 First, there’s The Food Store, a cafe and bakery, located on the first floor, that offers energy booster drinks, specialty teas and coffees, and a good variety of pastries and sandwiches, perfect for a meal on the go. 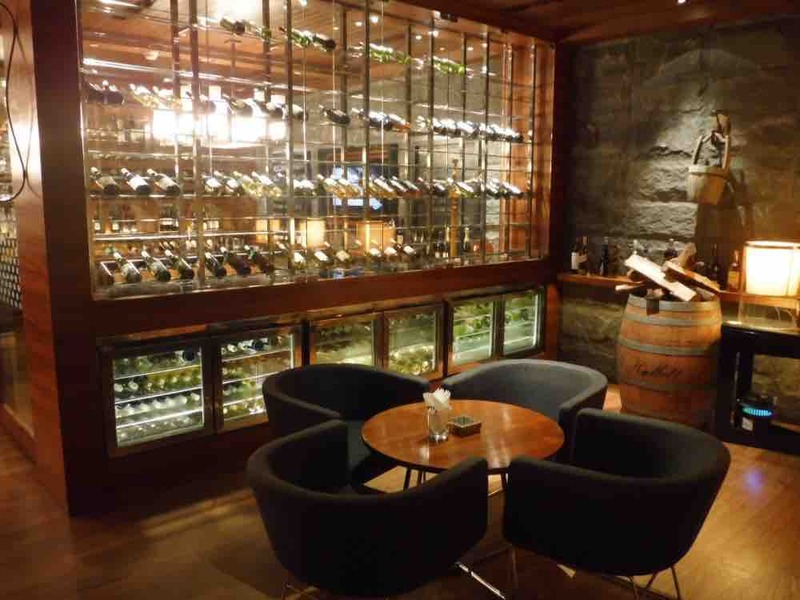 There’s also the Cellar Door, a smoking bar where wine, beers and speciality spirits can be enjoyed in a calm and rustic atmosphere. Next to the Cellar Door is the Axis Lounge, where we can enjoy live entertainment in the evening and a variety of treats and snacks. The Tosca, overlooking the pool, is an Italian Trattoria with a built pizza oven and bar, that also serve snacks all day to the people relaxing and having fun in the water. 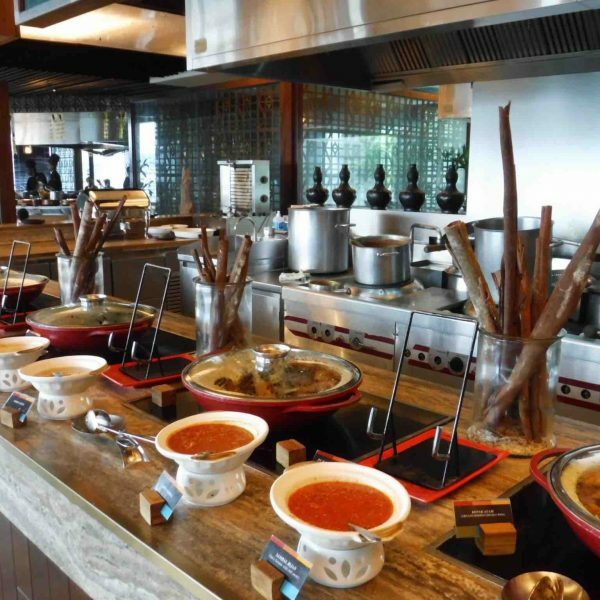 And there’s the DoubleTree KL’s signature restaurant: the Makan Kitchen, that offers 3 live, interactive kitchens, serving an extensive buffet of 6 local specialties: Malay, Chinese, Indian, Iban, Nyonya and Kristang cuisines. They serve breakfast, hi-tea at lunch and dinner. 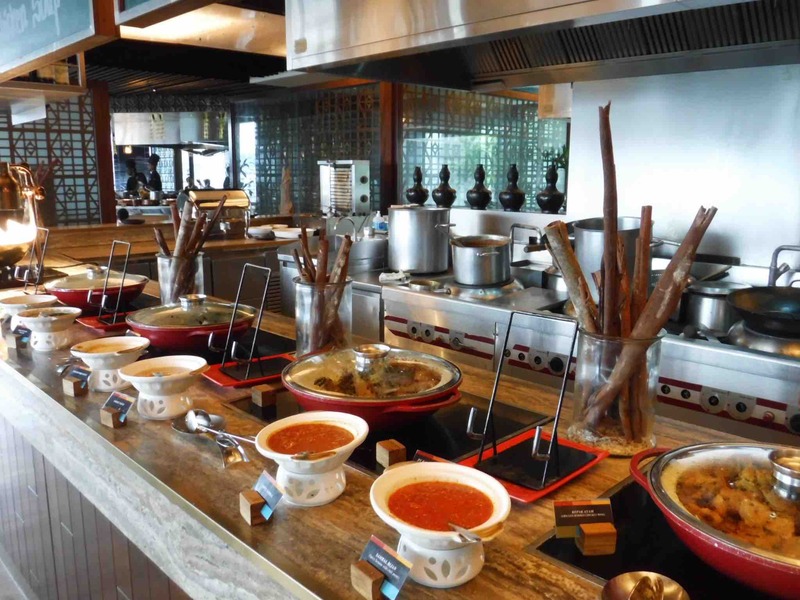 This is no ordinary buffet, but a culinary experience that I enjoyed so much, I recommend it to everyone who wants to discover Malaysia’s best delights. I had to try all their specialties, and I have to admit it has been the summum of all the culinary experiences I ever had. 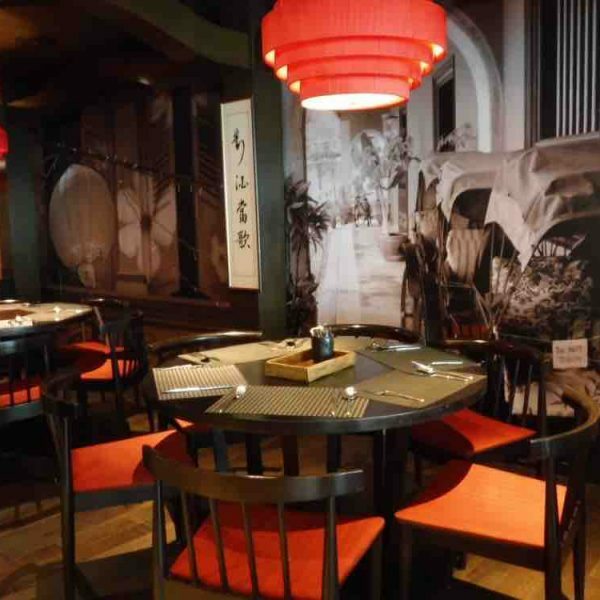 Adding to the charm is the different decors: from an authentic Malaysian long house to a traditional Peranakan setting. It is a little bit pricy, but bring your appetite and open your mind to another level of fine cuisine, and you won’t mind the bill. I didn’t. Every member of the staff we met or saw in the corridors said hello and smiled. The staff is very friendly and unpretentious. The staff goes beyond the expected behavior to make sure everyone in the family is taken care of, and that made me feel reassured, as a mom traveling in a foreign country. I knew that if we needed something, they would be there to help. We saw a lot of families with young kids at the hotel, and the staff was always nice with them. They made us feel welcome, and not as if we were disturbing other clients. 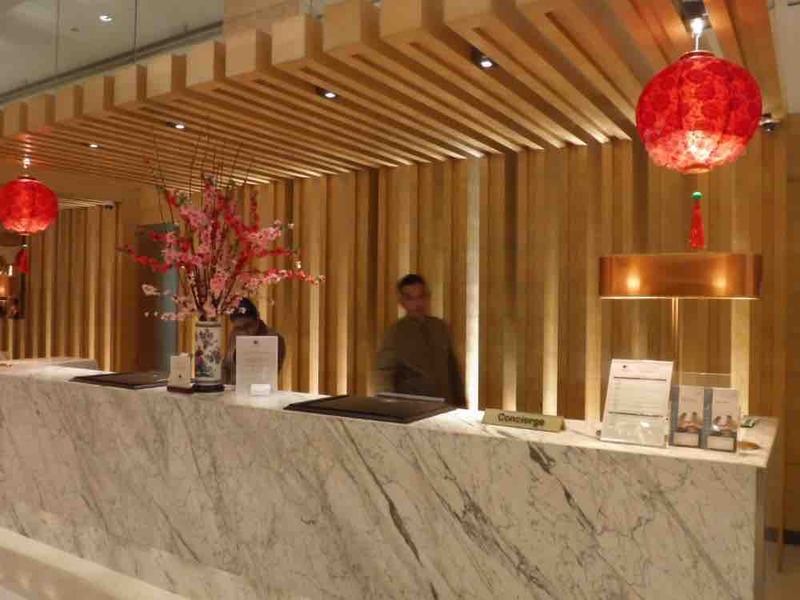 Furthermore, the staff’s attitude wasn’t cold or too high class, as we can see in other high-end hotels. When people are too polite and have high protocol, that makes me feel awkward because I don’t know how to behave. I feel out of place. But I didn’t feel that way at DoubleTree Kuala Lumpur. The staff is full of nice people helping people. 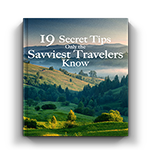 They are approachable and we don’t feel judged if we don’t fit in the high-society kind of people. 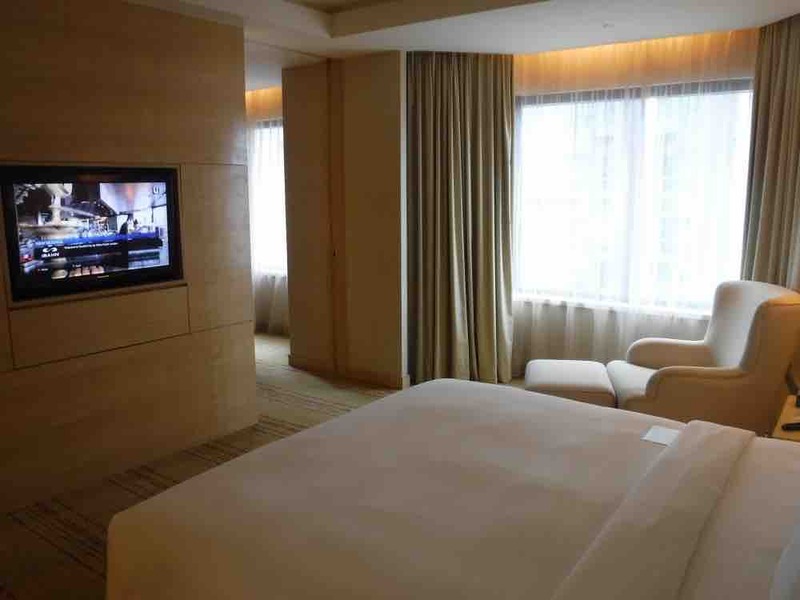 I really think the amenities are what made the DoubleTree KL stand out from other hotels. They have a couple of initiatives I want to tell you about, because I was really impressed. First, the basics. There’s plenty of elevators, and we need an access card to be able to reach the guest room levels, so even if the hotel is located in a multi-business building, it is secure and safe to stay there. 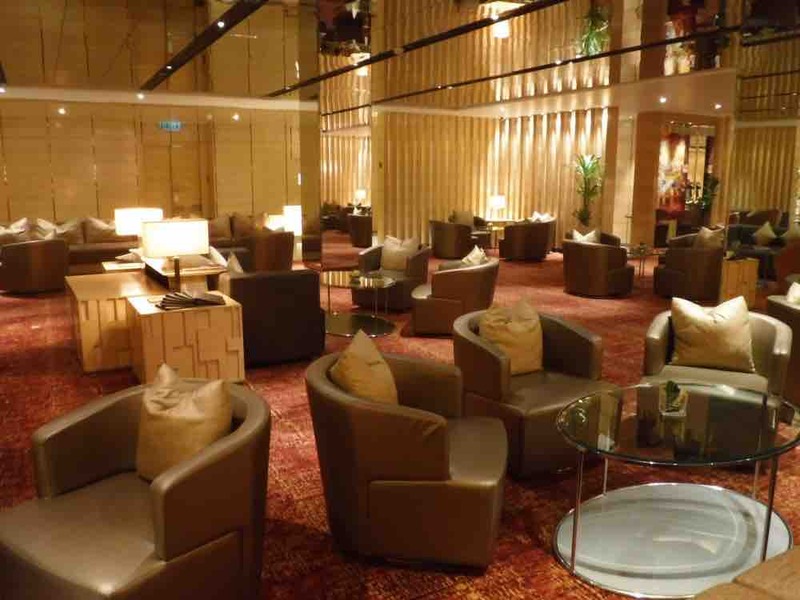 Besides welcoming cookies, fruit plates and local delicacies, we had access to the Executive Lounge, which is offering complimentary breakfast and evening cocktails and snacks. I think this is a big plus for families, because when kids are hungry, there’s not much time to find good food. So at the Executive Lounge, healthy and tasty food was always available: western and local hot and cold breakfast, good juices and really good coffee and tea for breakfast, and tapas, sandwiches, local specialities, dessert, wine, beer and drinks at happy hour. The wifi at the Lounge is even faster than the one we had in our room, so Emma-Kate was happy to watch her favorite YouTube videos while having a delightful snack. 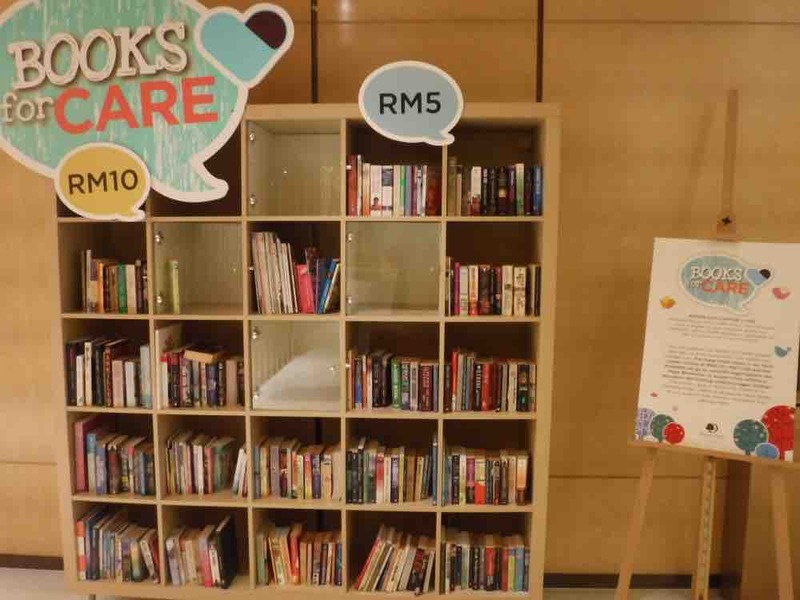 The DoubleTree KL also developed the Books for Care initiative, which is a great way to give back to the community. For example, Clinton bought a used book (donated previously by another guest) for RM10.00, and DoubleTree KL will donate the proceeds to a nonprofit organization like Hope Worldwide, to support their efforts in education and training underprivileged children. 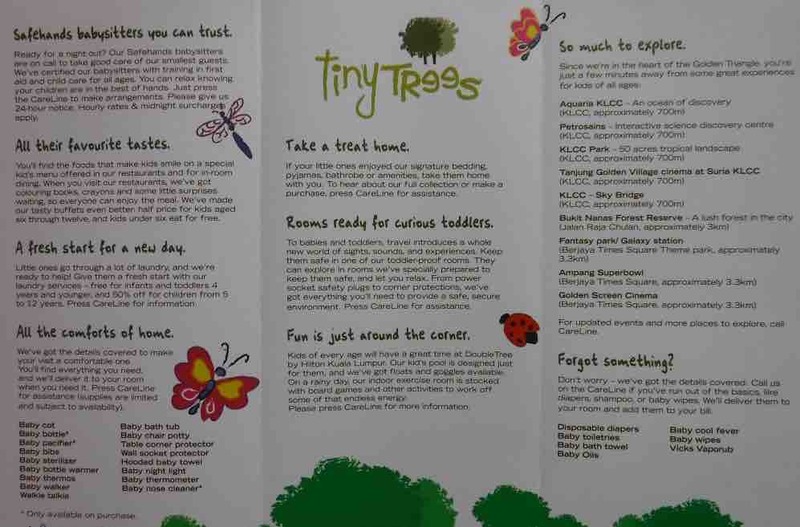 Now, the icing on the cake: the Tiny Trees Initiative. It’s the first time I have seen a hotel offering such an extensive program to accommodate families with young kids. With this program, we can make our hotel stay as comfortable and safe as home. For example, laundry services for kids 4 years and younger are free, and 50% off for kids from 5 to 12 years old. The DoubleTree KL also have baby and toddler-proof rooms, with power-socket safety plugs and corner protections, so children are safe and parents can relax. They even offer baby cots, bibs, bottler warmer, baby walker, chair potty, baby bath tub, and a lot more. Some items are free to use, other we can purchase, like diapers, wipes, baby bottle, pacifiers, nose cleaner, and so on. So if at midnight, I’d realize I needed a nose cleaner, but don’t have one on hand, I would call the CareLine and they would provide it for me. This is a worry-free program for parents, and I think it’s awesome (no, the DoubleTree KL is not paying me to say that, I really mean it). 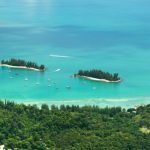 Here’s all the details of what the Tiny Tree Initiative offers. Located on the 10th floor, we could find 2 saltwater pools: 1 for all guests, and 1 for children. The main pool has large steps, so it’s easy even for kids to go down into the pool. There’s also a long seat where we could enjoy spa jets in the back and under the feet to relax and unwind. Moreover, a lot of lounge chairs, easy chairs and tables surround the pool. Towels are provided by the pool, and there was always enough for everyone. The kids’ pool is so beautiful! It is an infinity pool with fountains. The water isn’t deep, so even kids as young as 2 years old can have fun safely. Another smart thing about this pool: it is located at the best spot where we can find shade in the afternoon. 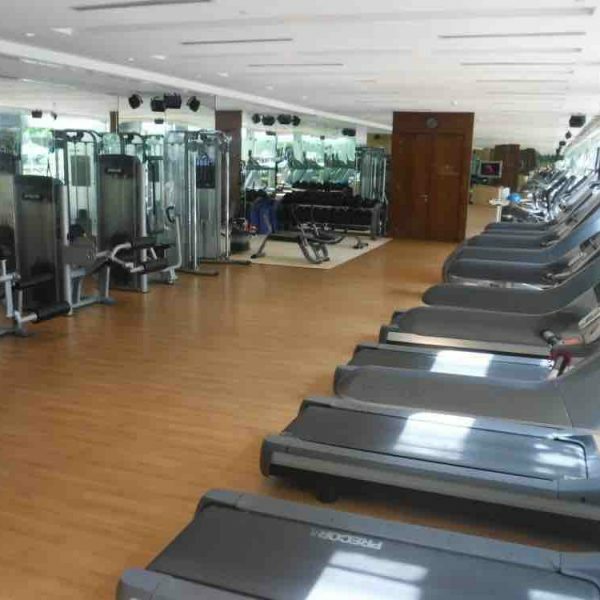 Next to the pool is the gym. 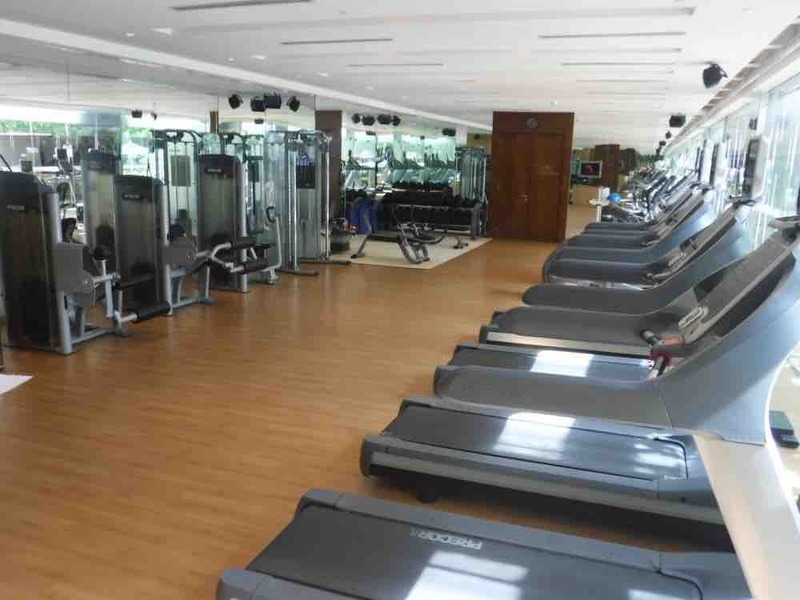 There is enough fitness equipment for everyone, and there are TVs to be entertained while training. 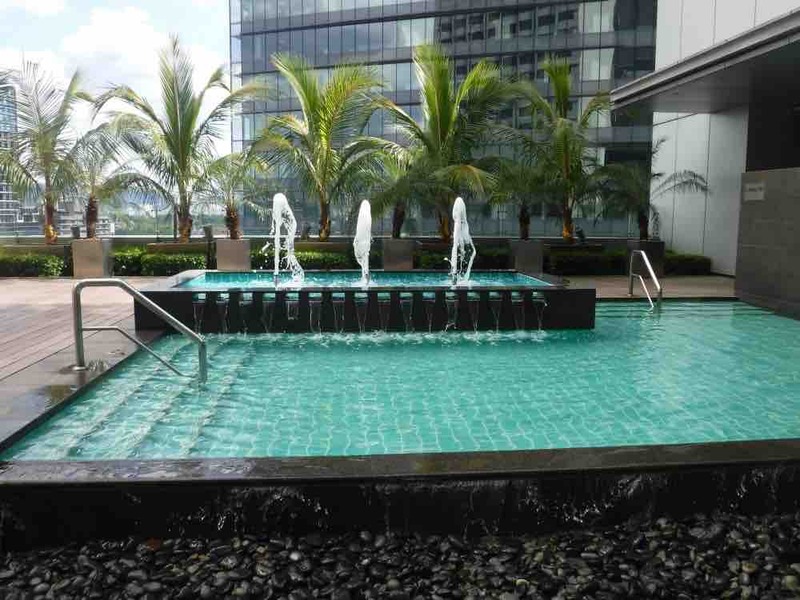 The location of the DoubleTree KL is another reason why we chose this hotel. We like to walk in the city and to the major sights. 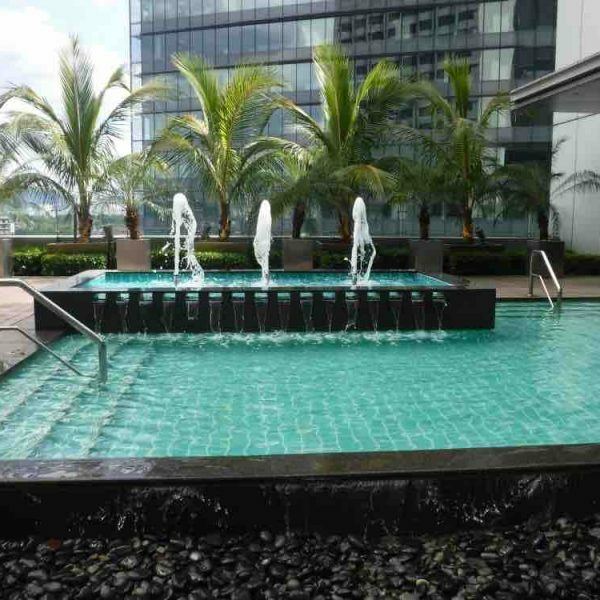 Located within Kuala Lumpur’s Golden Triangle district, just northeast of KL City Centre, it is within a walking distance of a lot of the city’s main sights. The Petronas Twin Towers are just 1km away, and can be reached by foot or with the DoubleTree KL’s complimentary scheduled shuttle service. 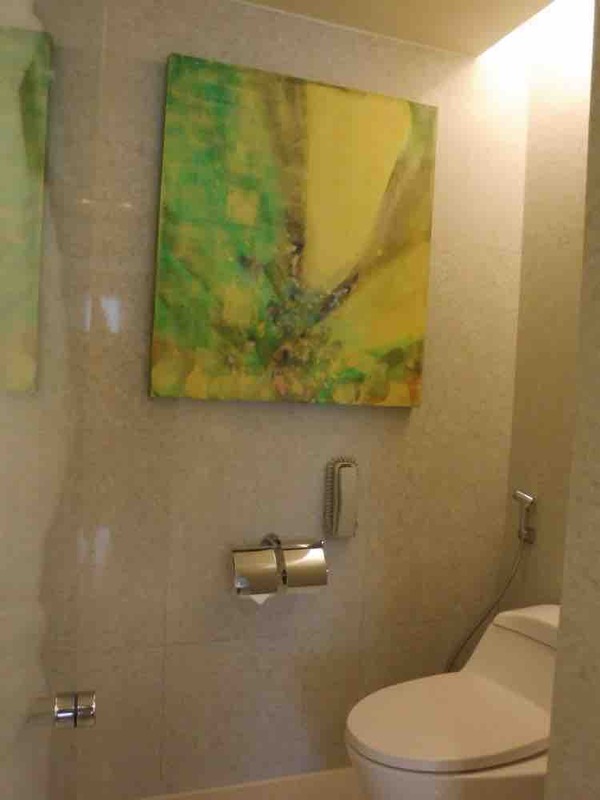 The hotel is also connected by a covered walkway to the Ampang Park LRT metro station, which brought us to the Kuala Lumpur Sentral Station in 15 minutes, where we took the KLIA Airport Express Train to KL International Airport (KLIA1 and KLIA2) in 28 minutes. With rooms starting at RM344 (US$82 for 1 king bed guest room, double occupancy, advanced purchase), almost everyone can enjoy a stay at the DoubleTree KL. The hotel is also accessible to disabled guest, so again, everyone is welcome. When staying in an Executive room (starting at RM472) or suite (starting at RM504), guests have access to the Executive Lounge (which we did), and I think that for the price difference (US$30 per room, not per person), it is worth it to pay a little bit more at first, but have access to a delicious and healthy breakfast, happy hour snacks and drinks (including alcohol), and super fast internet access. 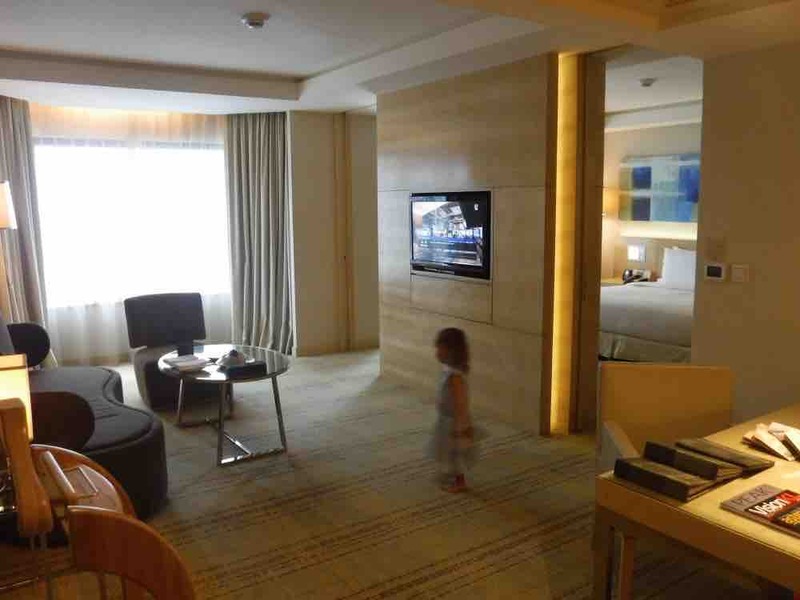 We enjoyed our stay at the DoubleTree KL so much! 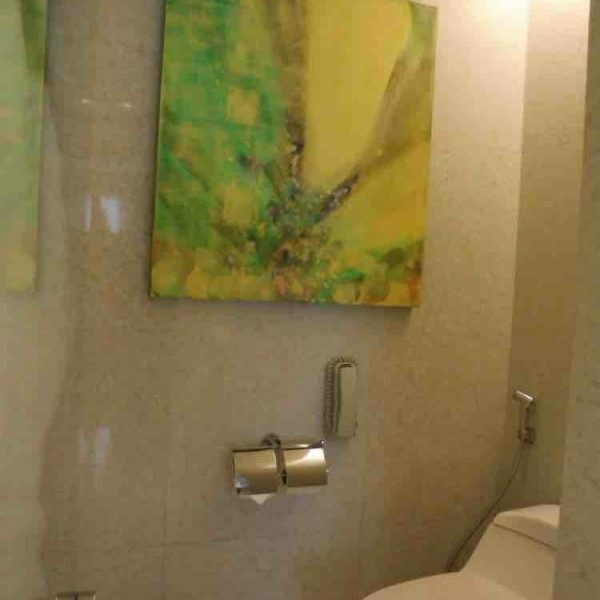 We even wondered if we wanted to visit as many sights as we thought at first, since we preferred to enjoy the hotel’s facilities and amenities more. We had a very comfortable stay, and the setting was perfect for Emma-Kate. We can tell the hotel’s management is taking very seriously the well-being of families with all the initiatives they have taken lately. I definitely recommend a stay at this renowned hotel. We are happy to announce that DoubleTree by Hilton Kuala Lumpur is now featuring in our Perfect Family Retreats Collection. Click here to discover our Curated Collection of Breezy Luxury Havens for Families! 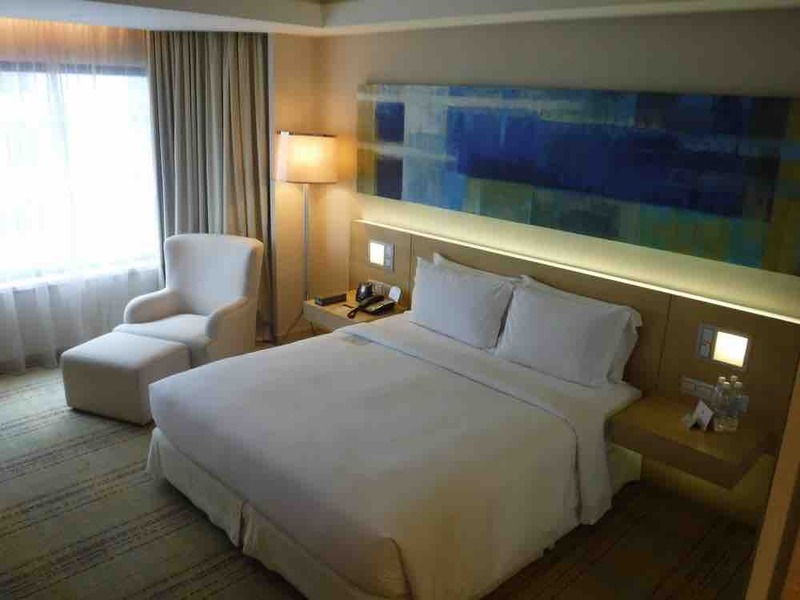 We want to thank the DoubleTree by Hilton Kuala Lumpur for hosting us during our stay in Kuala Lumpur, Malaysia. All opinions, as always, are my very own.